Introduction: Prescribing is the act of indicating one or more drugs to be administered to or taken by the patient, its dosage, and the duration of the treatment. It is a dynamic and individualized clinical process. Prescription has unique characteristics, but it may be inclined by cultural, social, economic and promotional factors. Aim: The aim was to evaluate the knowledge of drug prescription in 3 rd year and final year students at a private dental college. 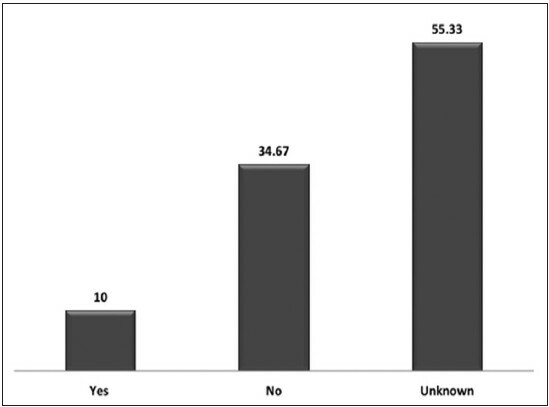 Methodology: A semi-structured questionnaire was used to 150 male and female, 3 rd year and 4 th year students of a private dental college from April 2014 to May 2014. The questionnaire consisted of 10 open-ended questions. Results: The main reason for prescribing medication was pain. The most commonly used nonsteroidal antiinflammatory drugs were diclofenac, followed by paracetamol and ketorolac. The most extensively prescribed antibiotics were amoxicillin. The main reasons for errors done by students were limited knowledge about correct posology of drugs. Students get their information for drug prescription mainly from professors, followed by classmates and pharmacology course. Most of the students were unaware about the Guide to Good Prescribing by World Health Organization. About 56.67% students had knowledge about dose of the drug prescribed. Conclusion: Pain was found to be the most significant reason for drug prescription. Amoxicillin was the most widely used antibiotic. Lack of knowledge about the posology of drug was the main reason for the error done by students. The current instructional method for teaching in various dental colleges, in India, is problem-based learning as it has been recognized worldwide. Prescription writing ability, a part of rational prescribing of medicine is being educated in zero unit (the education related to prescription writing starts at the same time when the student started doing clinical work). It is the just teaching program associated to the subject. Thus, the aim of this study was to evaluate the prescribing skill of third and final year students of bachelor of dental surgery (BDS) as the students' starts their clinical work from 3 rd year onward. A survey on the knowledge related to drug prescription was approved by the Institutional Review Board of a private dental college. A semi-structured pretested questionnaire with 10 open-ended questions was used for the study. The study was conducted at a private dental college in Uttrakhand, India, during the period of 1-month from April 2014 to May 2014. A pilot test was conducted on 30 students who were not incorporated in the main study to check the validity and reliability of the questionnaire. The testing and retesting of the questionnaire was done. A reliability coefficient (α) of 0.80 or more was considered acceptable. Further modifications were done in the questionnaire. The questions were rephrased, reframed, added, and removed from the questionnaire. Then the questionnaire was distributed among 150 3 rd year and 4 th -year students. Students with age 21-25 years equal number of girls and boys were included in the study. Informed consent was obtained from the participants before administration of the questionnaire. What is the most common health conditions treated in dental practice? Which is the most common nonsteroidal antiinflammatory drugs (NSAID) you prescribe? Which antibiotics are most commonly prescribed? What are the most common errors occur during prescription of drugs? What are your sources for prescription information? Do you use World Health Organization (WHO) Guide to Good Prescribing for drug prescription? Do you have appropriate knowledge about dose of Drug to be Prescribe? Do you know about the frequency of Drug to be prescribe? Do you know for how long the drug has to be given? Did you know the correct route of drug delivery? Data analysis was performed using SPSS version 17(Softonic, Barcelona, Spain) and data were presented in tabular and graphic form. Test of significance was done using Chi-square statistics with P < 0.05 considered as significant. A total of 150 third year and final year students, both girls and boys participated in the study. P =0.004 was found while co-relating knowledge about drug prescription between 3 rd year and final year students. Hence, the difference was statistically significant among the knowledge among final year students and 3 rd year dental students. 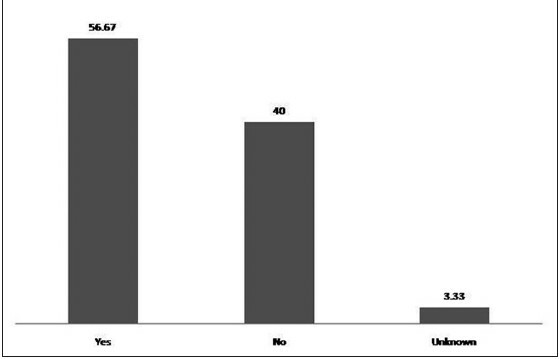 Most common health conditions treated in dental practice: To this question majority of respondents answered pain (50%) as the main reason for prescribing medication [Figure 1]. 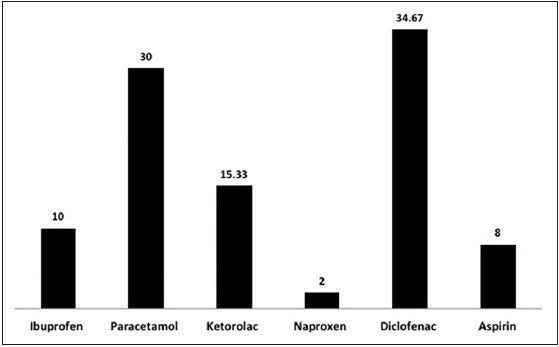 Most common nonsteroidal antiinflammatory drugs prescribed: The most common NSAID prescribed was diclofenac (34.67%) [Figure 2]. 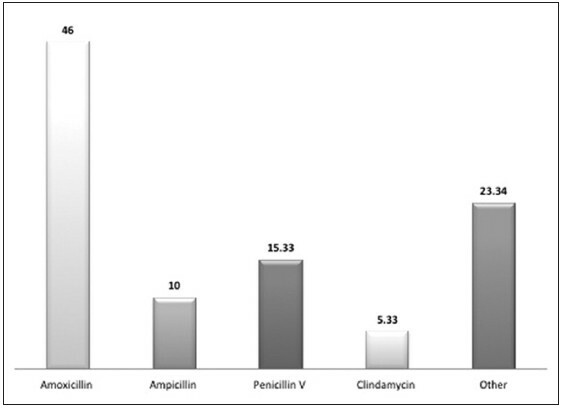 Most common antibiotics prescribed: Maximum number of students (46%) prescribed amoxicillin for majority of infections [Figure 3]. 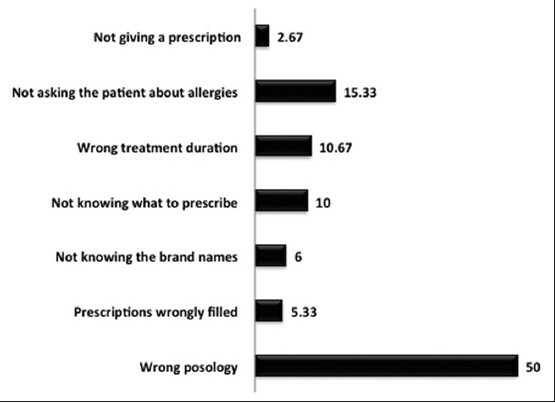 Most common error during prescription: 50% of students did error during prescription due to wrong posology [Figure 4]. 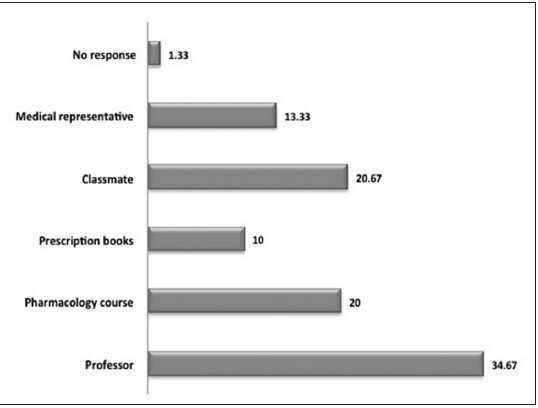 Sources of prescription information: 34.67% students sought information for prescription from professor [Figure 5]. WHO Guide to Good Prescribing used: 55.33% answered that they don't know about this book [Figure 6]. Knowledge about dose of the drug prescribed: 56.67% of the students answered that they know about the dose to be given to the patient. Frequency of drug to be prescribed: 60% of students answered that they know how many times the drug had to be prescribed. Knowledge of duration for which drug has to be prescribed: 61.33% of the students knows for how long the drug had to be given. 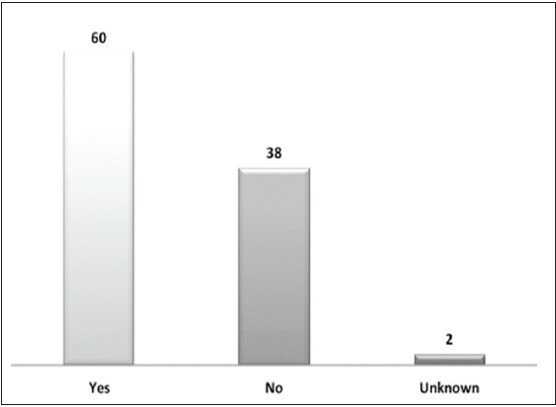 Knowledge about route of drug delivery: 67.33% of the students know about the route of drug administration [Figure 7], [Figure 8], [Figure 9], [Figure 10]. Amoxicillin outweigh the result with 46%. This is prescribed by maximum number of students (69), which is appropriate because it is the first choice in dentistry. , According to the American Heart Association,  antibiotic combinations can be prescribed for patients with systemic diseases mainly heart disease, recommends high doses of different antibiotics 30-60 min prior to commencement of the dental procedure, but it was not so any of the present case. Most of the students (34.67%) gather their information for prescribing from their professors, which is in agreement with previous study,  to get information from professors is good as this is stage of the student's development, but approximately 20.67% students still rely on their classmates for advice which is a lot more than previous studies. About 55.33% of students were not aware of WHO guidelines for prescribing which is tremendously more than previous studies while 10% follow the indications while prescribing which again lesser than previous studies. The main limitations of this study were that only 10 open-ended questions were used to conduct the survey, and a small sample size was considered. Future studies should evaluate prescription practices among teachers and general practitioners. Further studies in this field should be done to know the overall prescription writing skills of the students. Pain was found to be the most significant reason for drug prescription. Amoxicillin was the most widely used antibiotic. Lack of knowledge about the posology of drug was the main reason for the error done by students. Professors were the main source of knowledge about the prescription of drugs. There was a lack of knowledge related to WHO guide to good prescribing. The knowledge of prescribing drugs is of utmost need for good dental practice and hence, it is essential to expand the knowledge related to pharmacological therapy and to know about the proper therapeutic guidelines. Maxwell S, Walley T; BPS Clinical Section Committee. Teaching safe and effective prescribing in UK medical schools: A core curriculum for tomorrow's doctors. Br J Clin Pharmacol 2003;55:496-503. Rauniar GP, Roy RK, Das BP, Bhandari G, Bhattacharya SK. Prescription writing skills of pre-clinical medical and dental undergraduate students. JNMA J Nepal Med Assoc 2008;47:197-200. Guzmán-Álvarez R, Medeiros M, Lagunes LR, Campos-Sepúlveda A. Knowledge of drug prescription in dentistry students. Drug Healthc Patient Saf 2012;4:55-9. Mendonça JM, Lyra DP Jr, Rabelo JS, Siqueira JS, Balisa-Rocha BJ, Gimenes FR, et al. Analysis and detection of dental prescribing errors at primary health care units in Brazil. Pharm World Sci 2010;32:30-5. Srivastava R, Jyoti B, Dixit J, Priyadarshi P. Neutron therapy - A novel approach to radiotherapeutics: A review. Int J Contemp Med Res 2014;1:61-70. Cherry WR, Lee JY, Shugars DA, White RP Jr, Vann WF Jr. Antibiotic use for treating dental infections in children: A survey of dentists' prescribing practices. J Am Dent Assoc 2012;143:31-8. Kia SJ, Behravesh M, Sigaroudi AK. Evaluation of drug prescription pattern among general dental practitioners in Rasht, Iran. J Dentomaxillofac Radiol Pathol Surg 2013;1:18-23. Babalola CP, Awoleye SA, Akinyemi JO, Kotila OA. Evaluation of prescription pattern in Osun State (Southwest) Nigeria. J Public Health Epidemiol 2011;3:94-8. Jain A, Bhaskar DJ, Gupta D, Agali C, Gupta V, Gupta RK, et al. 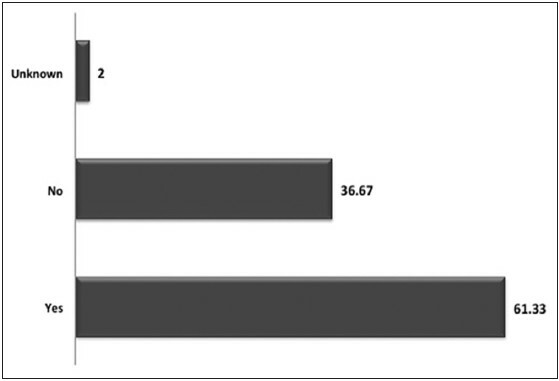 Comparative evaluation of honey, chlorhexidine Gluconate (0.2%) and combination of xylitol and chlorhexidine mouthwash (0.2%) on the clinical level of dental plaq que: A 30 days randomized control trial. Perspect Clin Res 2015;6:53-7. Oshikoya KA, Senbanjo IO, Amole OO. 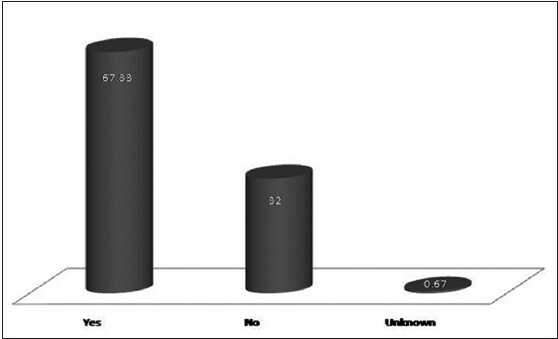 Interns' knowledge of clinical pharmacology and therapeutics after undergraduate and on-going internship training in Nigeria: A pilot study. BMC Med Educ 2009;9:50. Gupta D, Bhaskar DJ, Gupta RK, Jain A, Yadav P, Dalai DR, et al. Is complementary and alternative medicine effective in job satisfaction among dentists with musculoskeletal disorders? A cross sectional study. Medycyna Pracy 2014;65:317-23. World Health Organization. WHO Model List of Essential Medicines 2011. Available from: http://www.whqlibdoc.who.int/hq/2011/a95053_eng. [Last accessed on 2013 Apr]. Gupta D, Bhaskar DJ, Gupta RK, Karim B, Gupta V, Punia H, et al. Eff ect of Terminalia chebula extract and chlorhexidine on salivary pH and periodontal health: 2 weeks randomized control trial. Phytotherapy Research 2014;287:992-8. Jain A, Bhaskar DJ, Gupta D, Agali C, Gupta V, Mark R. Dental Hand for Rural population: Teledentistry. J Contemp Dent 2014;4:27-9. Gupta D, Batra R, Mahajan S, Bhaskar DJ, Jain A, Shiju M, et al. Comparative Evaluation of the Complementary and Alternative Medicine Therapy and Conventional Therapy Use for Musculoskeletal Disorders Management and Its Association with Job Satisfaction among Dentists of West India. J Tradit Complement Med 2014;4:263-7. Donaldson M, Goodchild JH. Appropriate analgesic prescribing for the general dentist. Gen Dent 2010;58:291-7. McNulty CA, Francis NA. Optimizing antibiotic prescribing in primary care settings in the UK: Findings of a BSAC multi-disciplinary workshop 2009. J Antimicrob Chemother 2010;65:2278-84. Lauber C, Lalh SS, Grace M, Smith MH, MacDougall K, West P, et al. Antibiotic prophylaxis practices in dentistry: A survey of dentists and physicians. J Can Dent Assoc 2007;73:245. Marek CL. Avoiding prescribing errors: A systematic approach. J Am Dent Assoc 1996;127:617-23. Gupta RK, Gupta D, Bhaskar DJ, Yadav A, Obaid K, Mishra S. Preliminary antiplaque efficacy of aloe vera mouthwash on 4 day plaque re-growth model: Randomized control trial. Ethiop J Health Sci 2014;24:139-44. Gupta D, Bhaskar DJ, Gupta RK, Karim B, Jain A, Singh R et al. A randomized controlled clinical trial of Ocimum sanctum and chlorhexidine mouthwash on dental plaque and gingival inflammation. J Ayurveda Integr Med 2014:5:109-16. Karim B, Bhaskar DJ, Agali C, Gupta D, Gupta RK, Jain A, et al. Effect of Aloe vera mouthwash on periodontal health: Triple blind randomized control trial. Oral Health Dent Manage 2014;13:14-9. Gupta D, Gupta RK, Bhaskar DJ, Gupta V. Comparative evaluation of terminalia chebula extract mouthwash and chlorhexidine mouthwash on plaque and gingival inflammation - 4-week randomized control trial. Oral Health Prev Dent 2014. doi: 10.3290/j.ohpd.a32994..
Megalaa N, Kayalvizhi G, Silas AJ, Sajeev R, Saravana Kumar MS. Role of herbal leaf extracts in caries prevention. Int J Contemp Med Res 2014;1:71-78. Gupta D, Gupta RK. Investigation of antibacterial efficacy of Acacia nilotica against salivary mutans streptococci: A randomized control trial. Gen Dent 2015;63:23-7. Gupta D, Dalai DR, Swapnadeep, Mehta P, Indra BN, Rastogi S, et al. Acupuncture - An emerging adjunct in routine oral care. J Tradit Complement Med 2014;4:218-23. Gupta D, Bhaskar DJ, Gupta KR, Karim B, Kanwar A, Jain A, et al. Use of complementary and alternative medicine for work related musculoskeletal disorders associated with job contentment in dental professionals: Indian outlook. Ethiop J Health Sci 2014;24:117-24. Agarwal A, Garg C, Agarwal M. A rare coexistence of primary and secondary vesical calculus in a case of benign prostatic hyperplasia with suprapubic cystostomy. Int J Contemp Med Res 2014;1:91-5. Gupta D, Bhaskar DJ, Gupta RK. Contemporary and Alternative Dentistry: Ayurveda in Dentistry. Germany: Lap Lambert Academic Publishing; 2013.